Looking for recipes that are uncomplicated, relaxed and yet always satisfying? Nigella has the answer. Simply Nigella is the perfect antidote to our busy lives: a calm celebration of food to soothe and uplift, containing 125 recipes to invigorate and inspire. Whatever the occasion, food - in the making and the eating - should always be pleasurable. Simply Nigella taps into the rhythms of our cooking lives. From quick and calm suppers (Miso Salmon, Cauliflower & Cashew Nut Curry) to stress-free ideas when catering for a crowd (Chicken Traybake with Bitter Orange & Fennel), or the instant joy of comfort food for cosy nights on the sofa (Thai Noodles with Cinnamon and Prawns), here is food guaranteed to make everyone feel good. Whether you need to create some breathing space at the end of a long week (Asian-Flavoured Short Ribs), indulge in a sweet treat (Lemon Pavlova, Chocolate Chip Cookie Dough Pots) or wake up to a strength-giving breakfast (Toasty Olive Oil Granola), Simply Nigella is filled with firm favourite recipes and guaranteed crowd pleasers. "I love Nigella Lawson’s writing and I love her recipes"
Nigella Lawson has written nine bestselling cookery books, including the classics How To Eat and How To Be a Domestic Goddess - the book that launched a thousand cupcakes. These books, her TV series and her Quick Collection app, have made her a household name around the world. In 2014 she was voted Best Food Personality in a readers' poll at the Observer Food Monthly Awards. 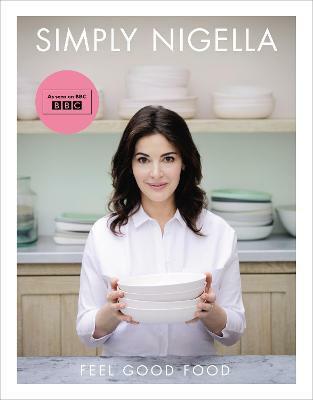 Simply Nigella is her tenth book, and will be accompanied by a 6-part, prime-time TV series on the BBC this autumn.